Mercurius vivus is the Latin name for a homeopathic remedy made from elemental mercury. The English word quicksilver is a literal translation of the Latin. Although Samuel Hahnemann, the founder of homeopathic medicine, also formulated a soluble preparation of mercury that he called Mercurius solubilis, most contemporary American homeopaths regard them as essentially the same remedies and use them to treat the same symptom profiles. According to Dr. von Boennighausen, Mercurius vivus is the remedy of choice for acute disorders of the skin and mucous membranes characterized by severe inflammation with pus formation and possibly areas of broken or raw skin. Disorders with this symptom profile include eye infections with discharges of pus; bacterial infections with pus behind the eardrum; sore throats with open patches of skin and pus formation; urinary tract infections; and such diseases of the skin as herpes and boils. Other disorders that are treated with Mercurius vivus include backache, chickenpox, colds, diarrhea, influenza, indigestion, mouth ulcers, and toothache accompanied by heavy salivation. The general symptoms that would suggest Mercurius vivus to a homeopath include heavy, foul-smelling perspiration; foul-smelling breath and body odor; copious, drooling salivation. Mercurius vivus patients are easily irritated by temperature or other environmental changes, and they are comfortable only within a narrow range of circumstances. They tend to tremble or shake, are generally weak, and easily tired by activity. These patients are slow to respond to treatment and infected parts of the body take a long time to heal and often appear severely diseased. According to Dr. von Boennighausen’s Characteristics (materia medica), a female Mercurius vivus patient is likely to have heavy periods, with painful cramps and anxiety. A nursing mother will produce milk that has a bad taste to the infant. A male patient may have burning pain on urination accompanied by thick mucus or pus from the urethra. The inflammatory sensations associated with Mercurius vivus symptoms are present throughout the body. The mouth and gums are typically sore and inflamed, and the patient may complain of a metallic taste in the mouth. The gums may ooze blood when touched, and the patient has often lost several teeth. If the patient has a headache, it will have a burning quality. The Mercurius vivus patient may also have feelings of gnawing or burning in the chest and abdomen. There may be little appetite for food, but often an intense thirst or desire for cold drinks. The mental and psychological symptoms of Mercurius vivus patients include restlessness, an agitated quality, and a tendency toward impatience and willfulness. The English word “mercurial” describes this general temperament. The patient may jabber or chatter rather than talking at a normal pace, and may act on impulse. These impulses sometimes lead to violence; Mercurius vivus patients may act out suicidal or murderous thoughts. Other personality traits of the Mercurius vivus patient are quarrelsomeness and dissatisfaction. In homeopathic practice, the circumstances or factors that make the patient feel better or worse are considered as important a part of the symptom profile as the physical indications. These circumstances, which include weather, time of day, level of activity, light or noise, body position, sleeping patterns, etc., are known as modalities. With Mercurius vivus patients, the modalities that make the patient’s condition worse include temperature extremes, open air, drafts, a warm bed, evening, being touched, lying on the right side, feeling sweaty, or eating something sweet. Those that make the patient feel better include moderate temperatures, dry weather, and sitting up while at rest. The most common form of Mercurius vivus preparation on the market is 30c or 30x tablets, although the remedy is also available in liquid form. The abbreviation 30c means that one part of mercury has been diluted with 99 parts of water or alcohol; this ratio is called a centesimal potency. This process of dilution, along with vigorous shaking of the remedy, has been repeated 30 times to achieve the desired potency. A potency of 30x is a decimal potency. In a decimal potency, one part of the medicine is mixed with nine parts of alcohol or water; thus 30x means that this decimal dilution has been repeated 30 times. In homeopathic practice, the strength of the remedy is in inverse proportion to the amount of chemical or plant extract in the alcohol or water; thus a 30c preparation of Mercurius vivus is considered a much higher potency than a 30x preparation. The tablet form of a homeopathic remedy is made by pouring the diluted liquid over sugar pills. Taken by itself, mercury is poisonous to humans and can cause irreversible damage to the nervous system even if the patient survives. Other symptoms of mercury poisoning include burning thirst, swelling and discoloration of the membranes lining the mouth, abdominal pain, bloody diarrhea, and shock. Hahnemann’s interest in accidental poisonings from medicines that were commonly used in the eighteenth century is one reason why mercury was one of the first substances that he studied. Since ancient times, mercury had been used for medicinal purposes to cleanse fever victims of toxins. In the modern world, however, mercury poisoning is more likely to result accidentally from breathing metallic vapors given off in certain industrial processes rather than from mercury-based medicines. 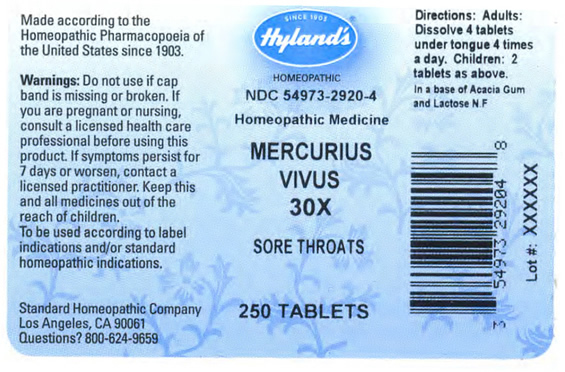 Standard homeopathic preparations of Mercurius vivus are so dilute that they are highly unlikely to cause mercury poisoning even if the patient takes a sizable overdose. Homeopathic remedies rarely have side effects in the usual sense of the phrase because they are so dilute. On the other hand, a homeopathic remedy may sometimes appear to be making a patient’s symptoms temporarily worse as part of the healing process. This worsening is called an aggravation. Aggravations are regarded by homeopaths as an indication that the remedy is effectively stimulating the patient’s body to heal itself. Mercurius vivus patients appear to be more likely to experience aggravations than patients given other remedies. Homeopathic preparations are so dilute that the chances of their interacting with conventional prescription medications are minimal. On the other hand, a typical homeopathic materia medica will include some brief notes about the interactions of some remedies. The action of Mercurius vivus is thought to be intensified by belladonna, silica, and Hepar sulphuricum.